Mona Majorowicz posted on her blog her personal 2009 Goals in Review. There she goes again, setting a good example for the rest of us. For any of you who are not aware of what S.M.A.R.T. (in relation to setting goals) stands for, I thought I’d research a bunch of web sites and then summarize. However, since there are so many variations and explanations of S.M.A.R.T., I’m basically acknowledging that I’m going to set goals for 2010, structuring them in such a way that I believe I can/will be accountable for them. (I.e., by setting S.M.A.R.T. goals.) Where I’m going to differ from Mona is that I’m not going to be brave enough to publish them! 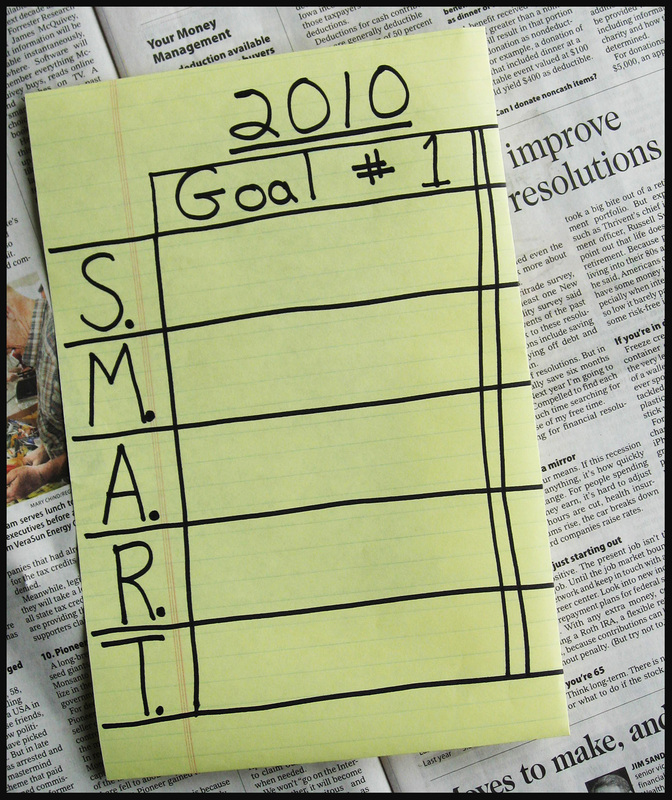 If you google “goals smart acronym” you’ll find a plethora of different perspectives on what the S.M.A.R.T. acronym letters stand for. Most sources agree on the basics, but have their own little twist. To glean what details would resonate most with me, I looked at most of the first ten “hits” in the Google listing (at the link at the beginning of this paragraph). Hmmm…In the spirit of efficiency (which will be a part of my 2010 goals) I’ll abruptly end this post and tie up some unrelated loose ends. Oh, my. “Tie up loose ends” is not specific. Nor measurable. I guess it is achievable…if I can figure out what the loose ends are. Hmmm…It is realistic…if I know what the loose ends are. Time Bound? Yes, I guess bound by today…but, what are those loose ends? Man…sigh…I guess I’d better go make a specific “to do” list so that I get off on a good S.M.A.R.T. foot for the day! Update: I see that Mona has now posted her Art Business Goals for 2010. This entry was posted on December 30, 2009 at 3:21 pm and is filed under Uncategorized. You can follow any responses to this entry through the RSS 2.0 feed. You can skip to the end and leave a response. Pinging is currently not allowed. So it’s New Year’s Eve (correction) day and the old fuddy duddies that we are, Mike is asleep and I’m trolling your blog looking for some reference to . . .
It’s nice to see someone actually setting SMARTgoals outside of the education setting. Oh, snowflakes are falling on the SMARTgoals.